Don't just take our word for it, read what our clients have to say about our work and their experience with us! With Love Studios made our wedding dreams come true! From day one of wedding planning my husband and I knew we needed to choose someone special to capture our special moments of our big day! With Love Studios was the best choice to make that happen! We are very pleased with our videos that Nadine and Kaila made for us! 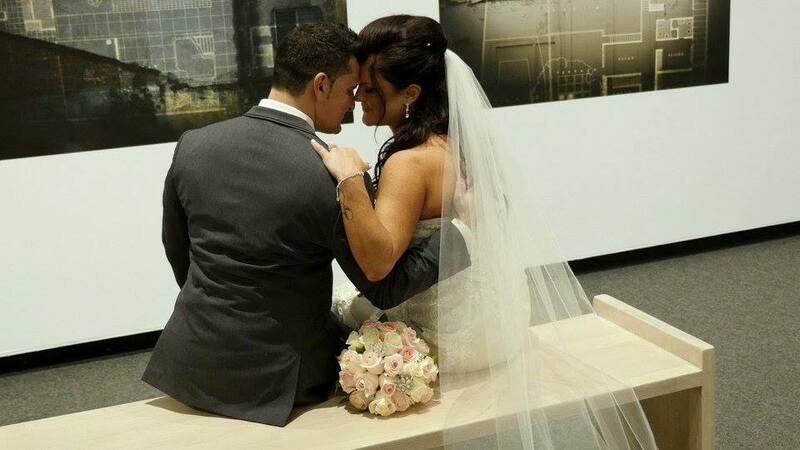 We have had so much positive feedback on our highlights, ceremony, and reception videos. Needless to say, everything With Love Studios provided for us was perfect! The girls are so personal, every touch they added to our videos were perfect from the music they choose to the details/ quality of their work!! And it is absolutely AMAZING. My husband, Taylor and I can’t thank you enough for how special you made our day. We feel so fortunate to have met you, and appreciate all the personal touches you added to make our wedding day even that much more special! "We absolutely loved working with With Love Studios"
"There are no words to describe how much we LOVE the wedding videos Kai and Nadine made for us. We have had many family, friends and even complete strangers tell us how perfectly the videos captured the feelings of love and joy that were a part of the day. Both ladies were friendly, professional and beyond organized. We absolutely loved working with With Love Studios and would highly recommend them to anyone looking for someone to capture an important moment in their lives. THANK YOU LADIES FOR EVERYTHING!" When my husband and I were planning our wedding, the one piece of advice we received the most was to hire a videographer. For months I searched online looking for the perfect fit - quality, affordable and professional. I hadn't found anyone that was the right fit then one day stumbled across a video on Facebook featuring With Love Studios....I was hooked. From the first email to receiving our finished product, Kai and Nadine made the experience of working with a videographer truly wonderful. Not only are they extremely talented but extremely kind as well. They made sure to capture our day in a way that was special to us while giving us their professional guidance as we had never worked with a videographer before. From accommodating the traveling, capturing our wedding rehearsal right up to all the crazy dancing on the night of the wedding - they truly went above and beyond to capture our day. They made every step of the process enjoyable and stress free. Now I understand why it was the one piece of advice we received the most about our wedding. We will forever have the most amazing keepsake to show our future children and grandchildren and never forget the love and energy that filled the room on our special day. From the bottom of our hearts, thank you Kai & Nadine. "When we first started planning our wedding, we weren't sure if we would be able to afford having a videographer, but after giving it some thought we decided to look into our options. After doing some research, I came upon the With Love Studios Facebook page and started watching the videos. I instantly fell in love with how beautifully the videos captured the day and I knew that after looking at many options, Kai and Nadine would be able to capture our special day perfectly. We didn't have the chance to meet with Kai and Nadine until June, just two months before our wedding, but after meeting with them, we felt like they were a perfect fit and knew that we had chosen wisely. They were both so friendly, and it was so evident by their excitement how seriously they took their job. On our wedding day, Kai and Nadine were amazing! They got along so well with our family and friends, and they made Lee and I feel so comfortable. They were there at all times to capture every little detail, making sure nothing was missed. Our wedding videos completely exceeded our expectations. We are forever grateful to Kai and Nadine for capturing our wedding so perfectly. We have these beautiful memories to last us a lifetime and that will forever remind us of the magic of the day. Choosing With Love Studios was by far the best and easiest decision we made for our wedding, and we have nothing but wonderful things to say about Kai and Nadine." "With love Does An amazing job"
"Nadine and Kaila are amazing to work with! They are so passionate and dedicated to their work and it shows. Business wise, they're prompt, thorough and aim to achieve excellence, now add to that their constant smiles, upbeat personalities and kind hearts and you have a team of gold. Our wedding video made us smile and cry, and of course we will be biased to that, but when we saw comments made from people we didn't even know - saying how much they loved our video and how it made them smile was truly amazing. WITH LOVE does an amazing job of capturing your day and delivers their contagious smile with their work. If you want any life event to feel as though it was filmed by family - WITH LOVE is the perfect fit. Thank you ladies, for your dedication and continued hard work even after the day was done. Our wedding videos will be cherished forever.♥"
"I didn't know a wedding video could be so amazing"
"When the idea for a wedding video first came up, I have to admit I was skeptical. After all, who wants to sit through hours of footage, especially speeches and drunken testimonials? I mean, when would you ever watch that again? Enter Kaila and Nadine of With Love Studios. Capturing the day in such an amazing, creative and unique way was no small feat - I'm sure - but they did it with so much love and enthusiasm, I knew the final product was going to be something special. And I was so right. Every moment, even the little ones my husband and I missed during the proverbial tempest of activity swirling throughout the day, was caught perfectly - paired with a lovely tune none of us could get out of our head for days. In less than an hour (we had to watch it a dozen or so times ourselves, of course) I found myself as that giddy bride, eager to show off the video to anyone who had three minutes to spare. Eye rolls and sighs at the prospect of watching "another wedding video" soon turned into ooh's and ahh's. The most common reaction? Wow, I didn't know a wedding video could be so amazing! There aren't enough ways in the world to express my gratitude to Kaila and Nadine. With a gift for storytelling and amazing imagery, this pair has definitely found their calling. Thank you. Thank you. Thank you - a million times over. Your Jedi bride and groom, Whit and Jay." "Kaila and Nadine...where do I even begin? I shall start from the beginning, from our first meeting..the moment we met two of the most incredibly friendly, professional, confident and enthusiastic girls we have ever encountered. Adrian and I both walked away that day knowing you would be the ones..the ones we trusted to capture our special day..we didn't feel the need to meet with anyone else. The decision to hire you both as our videographers was our best and our easiest decision of our wedding planning. Little did I know what a huge role you would play on that day...from being a peaceful, calming presence on a stressful day, to fixing out of strand wedding hair, offering numerous reassurances, to showing the guys how to put on cuff links and tuxes the proper way, right down to reminding them of their timeline (turn the hockey game off now boys..time to get dressed)! You girls went over and beyond what your job entailed..and for that I can't thank you enough. Finally, to the night of the wedding..you not only captured all the beautiful moments...you captured the emotions and that is truly a gift only professionals can give...in fact you were so professional we never noticed your cameras..but when we needed you for anything else such as a wedding dress bustle re-adjustment in the middle of a dance floor you were right there..we didn't ask..we didn't have to..like a friend you just knew what to do..and..like professionals the cameras kept rolling! Who does that? YOU two do! I can go on and on about how thankful I am to you for the memories and your amazing work..but most of all I am thankful that we met as strangers and because of your beautiful personalities...we walked away as friends. I would, and have already, highly recommended you to all my friends..and to anyone else who wants to hold onto and capture their special life moments...because trust me they pass so fast...they will be forgotten ... but thanks to you both every time we watch the video you made, we are brought right back into the moment and remember the emotions we all felt..and that my friends...well that is priceless." "With Love's services was a huge surprise for us on our wedding day! We had friends who recommended them, however it was too close to our big day and we just had no more wiggle room in our budget. My maid of honor arranged to have them surprise us, they were her wedding gift to us. We are so incredibly thankful that she did this for us! Kai & Nadine did an amazing job capturing our day! They were with us start to finish and went above and beyond to be helpful and make sure everything was perfect! They were very professional, but so personable that they felt like friends! Not to mention how extremely talented they are! Our highlight video brought us to tears! This is such a great way to keep a memory of a lifetime for years to come and now I can't imagine not having this! (I can't stop watching it!) Thank you so much from the bottoms of our hearts for capturing one of the best days of our lives, our love for our family, friends and especially our love for one another!" "Incredibly great service from beginning to end - my wife and I strongly endorse and recommend With Love Studios videography services. We were really happy with the entire process, from timely effective communication, fun positive environment on the day of and a polished and AMAZING finished product, we couldn't be happier. Initially, I was against the idea of a wedding video for two main reasons 1) I thought wedding videos these days were too cheesy and 2) $$$ wedding expenses were greater than I expected. But, we decided to look into it and after meeting with Kaila and Nadine, they put all of our worries to rest. They really understood what we wanted from a wedding video and let us feel apart of the planning process. The footage and creative design of the video captures everything we discussed and now we have an amazing snapshot of our entire day to reminisce and share with our family and friends. The video was one of the best purchases we made for the wedding and worth every penny. We are so happy that we decided to get a video and that we went with With Love Studios."